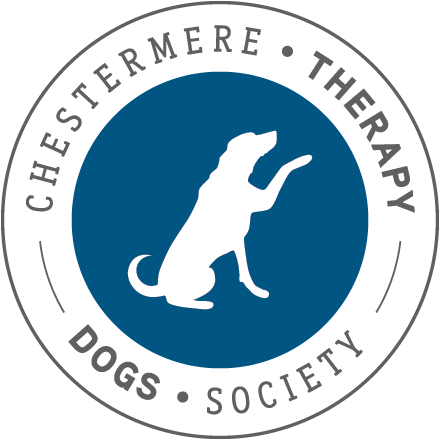 Since its launch in December 2013, the CTDS (Chestermere Therapy Dogs Society), has been providing amazing services through the programs they run. It started with the very popular ‘Listening Tails’ program designed to help young children improve their reading skills and confidence in reading out loud by reading to therapy dogs. Shortly after the kickoff of their first program, the equally popular ‘Visiting Tails’ program came into full swing. This program is set up with one objective in mind: to enhance a senior’s quality of life by having them interact with our therapy dogs. Many studies and programs across North America and in Europe have found that seniors experience an improvement in their physical and mental health by having experienced visiting with dogs. Dogs feed off the positive energy that a friendly welcome brings and, in return, exude positive feelings back to the seniors. But now, there is a new program on the horizon. ‘Caring Tails’ has just been launched with the concept of helping with stress relief, anxiety – especially with students. Chestermere High School and the Community Learning Centre are already using this program in their facilities. Students that are feeling anxious, whether by situations at school or in their home lives, get some time in a quiet room where they can just spend some time with one of the dogs that have been thoroughly accessed for this program. Dogs definitely help people in providing relief from anxiety. This statement is based on research conducted at the University of Missouri-Columbia. Research revealed that human beings are able to produce serotonin, prolactin, and oxytocin when they interact with their pet dogs. The production of these feel good hormones is important for people who are battling anxiety and depression. Studies also show that animals can reduce tension and improve mood. Along with treatment, spending time with a dog can help some people with mild to moderate depression feel better. They can ease loneliness, reduce stress, promote special interaction, encourage exercise and playfulness and provide what most people crave – unconditional love and affection. CTDS is also beginning a relationship with Strathmore Victim Services where by the CTDS would provide dogs, along with their thoroughly trained handlers, to assist in traumatic incidents. A moving example of this would be the recent mass murder of the five University students in April 2014. In the days following this senseless tragedy, dogs were taken to Mount Royal University to provide comfort to those that were affected and saddened by the loss of their classmates and friends. This is just one example, but it has been proven that dogs can be very therapeutic and helpful in times of stress and tragedy. As the CTDS grows, they are always looking for volunteers – especially dogs and handlers. If you are interested in joining them, or if you would like more information on any of their programs you can visit http://ctds.ca/ or contact Steve King at (587) 581-5571 or info@ctds.ca.